edited by Geoffrey M. Vaughan. The Catholic University of America Press, 2018. 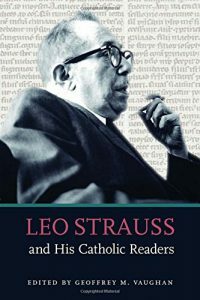 Leo Strauss greatly revived the study of political philosophy in the twentieth century and in the process reinvigorated discussion of the permanent questions of politics. Many Catholic thinkers who desired to engage modernity in its philosophical and political depths found in Strauss a worthy guide, in part because of the weaknesses of Catholic thought in addressing modern political and social conditions. This meeting of Strauss’s mind and Catholic minds is worthy of consideration, for it led to significant questions and debates about faith and reason, the ancient and modern political worlds, the place of the philosopher, and the contest of natural right versus natural law, to name a few. Can the real differences between Strauss’s oeuvre and the Catholic intellectual tradition be reconciled? If not, what do such divergences amount to for Catholic thinkers who have a certain lowercase piety for Strauss? The excellent volume of essays, Leo Strauss and His Catholic Readers, edited by Geoffrey M. Vaughan, considers these questions and more. Leo Strauss begins Natural Right and History (1953) by quoting from the Declaration of Independence’s second paragraph, which he followed with two questions: “Does this nation in its maturity still cherish the faith in which it was conceived and raised? Does it still hold those ‘truths to be self-evident’?” Strauss’s pointed question, one that parallels nicely with the University of Detroit lectures, compels re-engagement with the Western tradition of political thought. Strauss’s appeal to the self-evident principles of the Declaration of Independence clarifies, though, as much as it might obscure political truth for the Catholic thinker. What is the foundation for the Declaration’s natural rights? Is it the god of the philosophers? Is it Enlightenment reasoning and methodology? Is it rearticulation of Aristotelian political thought, one that takes into account John Locke? The Catholic thinker might point instead to the relational and trinitarian God of Christian theology as the proper source of these rights because of the equal creation of persons by God. Alexis de Tocqueville sounded this theme in Democracy in America, that it was God come down to earth as man that raised man’s stature to one of equal standing, laying the foundation for human equality and democracy. Moreover, while the Christian doctrine of the Incarnation ennobled man’s status, making the slave our brother, it also removed from the state any comprehensive and total claim that it could make on citizens. Thus we have rights antecedent to state authority. The soul had its end above the state. Thus civil theology came to an end. Enlightenment thinkers who discovered equality and limited government were only working with secularized and secularizing concepts derivative of this overarching Christian tradition. Strauss wisely begins our enquiry into a proper defense of the American constitutional order, but the answers the Catholic scholar poses to that question go beyond the classical tradition or Athens alone. In Catholic intellectual circles you sometimes hear the observation that Catholic social thought is the Church’s best kept secret. At times I have wished it were true. Doing justice to this intuition is Douglas Kries’s essay on Augustine scholar Ernest Fortin, who learned from Strauss how modern political philosophy had replaced duties with rights and normative nature with man’s subjective appetites for happiness. In his day, Fortin confronted a significant strand in Catholic academic thought, exemplified perhaps above all by Jacques Maritain, which held that the natural rights dispensation was a logical outgrowth of premodern natural law and not an inversion of it. Building on his learning from Strauss, Fortin criticized Catholic social thought for unthinkingly synthesizing the premodern teleological world of nature and duties with modern thought and its “non-teleological view of nature.” In particular, Fortin took on Rerum Novarum (1891), the encyclical that inaugurated Catholic social teaching, for the document’s use of Lockean property rights, a doctrine built on atheistic “self-ownership” as opposed to a hierarchical view of man as a steward of resources within a political community and its common good under God. In so doing, Fortin observed, the Church uncritically endorsed a revolutionary rights view of morality “as authentic Christian doctrine.” I think Fortin may have missed the target here, even though his broader concerns are well-founded. The Lockean property rights concept does relatively small work in Rerum Novarum. The encyclical’s ultimate purpose was to address a turbulent industrial and urbanizing period with arguments that grounded and protected the institutions that are central to human flourishing: family, religion, and civil society. Rerum Novarum articulated why these societies shouldn’t be consumed by either socialist government or by modern liberal government indifferent to their existence. The real problem with modern Catholic social thought, one related to Fortin’s critique, is its unfocused disposition. In his recent essay in First Things, “The Three Necessary Societies,” Russell Hittinger wonders if this tradition is “so overwhelmed that it can only give authoritative blessing to a series of juxtaposed responses to crises—a tradition awaiting synthesis.” This failure of coherence that Fortin understood has been brutally exposed by the papacy of Pope Francis, whose teaching letters are, among other things, a mashup of collectivism, unbound environmentalism, technocratic appeals to transnational governance, and humanitarian preening, with all of this written in complete ignorance of the Western constitutional tradition and the dignity and protections it affords human persons. A coherent and synthesized tradition would surely rebuke any attempt to reduce Catholicism to a message inspired by the humanitarianism of Brussels and the economics of Caracas. Alas, that tradition must be developed and cultivated, and Fr. Ernest Fortin’s work, influenced by Strauss, is an excellent starting point. James Stoner’s essay “Aristotelian Metaphysics and Modern Science: Leo Strauss on What Nature Is” continues this line of reasoning, but argues in an alternative vein. He argues that Strauss’s deep critique of modernist political thinking could only be valid if he assumed that classical metaphysical principles were true. Stoner asserts that Strauss thought-together the works of Plato and Aristotle for most of his career and did not set them apart. Strauss’s goal, ultimately, is to keep “classical philosophy” alive, and that means classical metaphysics must supply the armature of a noble quest for the whole. But whether Strauss ever offered this argument is open to question. The commonalities that this metaphysics has with biblical religion are significant, but Stoner also notes, the differences are profound as well. Strauss evaluates modernity from pre-modernity. Athens is the standard and, it would seem, the exitus and reditus of the West, according to Strauss. Christianity as such contributes to the shape of the Western mind, of course, but its offerings are mixed and must be scrutinized. Ralph Hancock’s truly penetrating essay, “Leo Strauss’s Profound and Fragile Critique of Christianity,” addresses Strauss’s well-known theme of the great polarity between Athens and Jerusalem, which, he claimed, is “the secret of the vitality of the West.” But I wonder if Strauss’s thinking here helps us understand how the dialectical “vitality” of these two philosophical and religious cities actually came about? In the historical reality of the West, the two came together, first under Rome, then under Roman Christianity, which produced a cultural reality drawn from both. That is, the tension and conflict only matters if something like the Christendom of Europe came into being and gave rise to a cultural framework composed of the secular and the sacred. Otherwise, Jerusalem and Athens would seem to have little to contribute or oppose to one another. Marc Guerra’s illuminating essay “Strauss and Benedict XVI” ties these strands together by exploring how Strauss and Benedict both understood modernity to be a challenge to human freedom and truth, but they understood the causality of that challenge to issue from different sources. Unlike Strauss, Benedict does not think modernity primarily sprang from revolutionary strivings in political philosophy. Rather, modernity itself, for Benedict, is something of a byproduct of intellectual mistakes made about the nature of reason and of man himself by thinkers from Galileo to Karl Marx. between his eternal Creator Spirit and our created reason there exists a real analogy, in which—as the Fourth Lateran Council in 1215 stated—unlikeness remains infinitely greater than likeness, yet not to the point of abolishing analogy and its language. God does not become more divine when we push him away from us in a sheer, impenetrable voluntarism; rather, the truly divine God is the God who has revealed himself as logos and, as logos, has acted and continues to act lovingly on our behalf. Moreover, Christianity through the eternal Logos becoming flesh adds to our understanding of the permanent problems, opening up the closed world of the classical philosopher. We now have to confront an account of God as both logos and as relational and full of personal love for his creation. Benedict points to the deeper truth that redeems and opens reason: the love of a dynamic creative God who loves man to the end, and the love of his creatures for him and for one another under the conditions of a new freedom. But this is not emancipation for autonomous living, but freedom in humility and dependence, that makes us free to love, to serve, and to work in a divinely created world. Strauss’s work brims with political and philosophical wisdom, calling us to measured judgments and sanity itself in unsettled modern conditions. I know that Strauss has been such a voice in my learning many times. But reason asks questions that it really can’t answer. Among these questions is, what can be hoped for with this life? Strauss’s Socratic rationalism has an answer of living with doubt, imperfection, and striving forward courageously to obtain knowledge of the whole, a home that you will never reach. But that’s more faith or will than reason. One might reasonably propose that certain questions are best answered by God and man, together. Fallibility and imperfection are the lot of humans, frequently contributing to acts of evil. No one escapes the darkness, and the classical philosopher and the Catholic acknowledge it in separate ways. But one of those paths may touch wholeness more reasonably, more in touch with a human nature always shaped by love, a wholeness that emerges not from knowledge gained but from mercy received. Richard M. Reinsch II is the editor of Seeking the Truth: An Orestes Brownson Anthology and is coauthor with Peter Augustine Lawler of the forthcoming book A Constitution in Full: Recovering the Unwritten Foundation of American Liberty (University Press of Kansas, May 2019).